When you're expecting a second or third child, you’ll want to make your first child feel important and included when your new baby arrives. A great way to do that is with a cool new T-shirt that flaunts your son's or daughter’s new status as a big brother or big sister. But with so many coordinating sibling T-shirt options out there, it’s hard to decide on or even find a perfect shirt set for your children. And if you have multiple siblings, finding cute shirts for everyone can be an even bigger challenge. Many children’s clothing retailers sell big brother, little brother, big sister and little sister themed shirts, however it can be difficult to find a pair of coordinating T-shirts sold together. One of the best places to find matching sibling tees is on Amazon.com. They sell numerous sibling T-shirts together as sets and offer a range of sizes for every sibling in your brood. If you want to personalize matching sibling T-shirts with your children’s names, Etsy.com and Cafepress.com are the best places to find cute customizable designs. Looking for a fun sibling T-shirt set? Check out our roundup of 12 cute sibling shirts that your little ones will be proud to wear together. 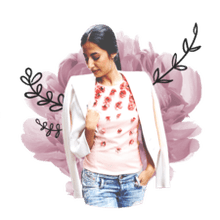 Got a couple of little fashionistas? 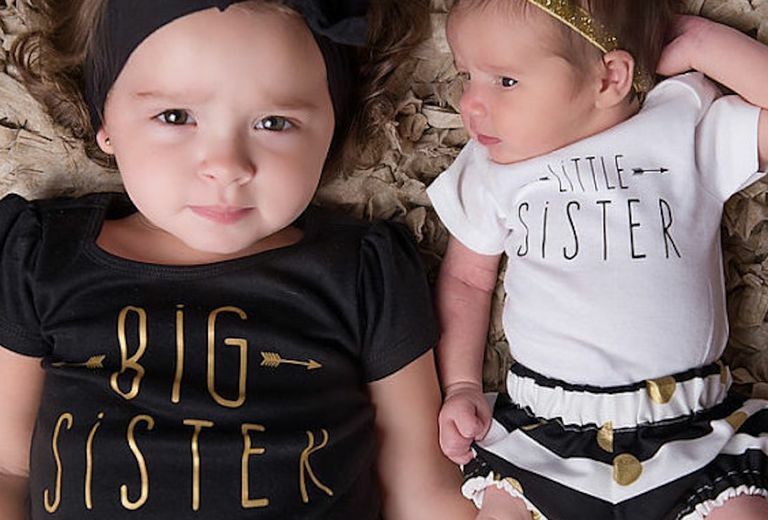 Take matching sibling tees one step further with these coordinating big sister and little sister outfits that boast a little glam and glitz with its gold and black lettering and details. Big brothers (and big sisters) truly rock in the eyes of younger siblings. But until they’re older, all that baby brothers and sisters can do is roll—on the floor, on the bed, under furniture. That’s why this pair of shirts is perfect and oh-so cool for your little ones. When your son becomes a big brother, he’ll totally feel like a superhero brother in this T-shirt adorned with the mask of the Caped Crusader. And if he has a little brother, he’ll have the perfect Robin as his little sidekick. In these shirts, brothers will gladly unite to fight crime (and hopefully not their parents) together as a superhero duo. Mustaches are still all the rage—even for babies. So if daddy has a mustache, then this cool pair of “If You Mustache I’m the Big Brother/Little Brother” shirts are the perfect tees for your little boys. To avoid another World War II, just follow the advice on these shirts that parodies the motivational words on the 1939 British government poster, "Keep Calm and Carry On." Just keep calm and let everyone know each brother’s place in the family with these smart shirts. Huge purple font featuring a girl’s silhouette adorns this sweet pink Big Sister shirt, while the Lil Mister bodysuit features a mustached businessman. The pair of tees are super adorable and eye-catching. If big brother loves everything “Star Wars,” chances are his little brother will adore it, too. All little bros want to be like big bro, right? So for every Big Jedi there is a Lil’ Jedi who will become his apprentice and learn the ways of the force. These cute shirts work for Jedi girls, too, plus they can be personalized with your children’s names. Oversized vintage letters in pink and purple proclaim your daughters’ big and little sister status and each of their names. These shirts are so happy, joyful and totally hip that your girls will want to wear them daily. What’s better than coordinating sibling T-shirts? Head-to-toe coordinating sibling outfits like these super hip rustic-themed ensembles adorned with deer and arrows. Modern colors and fresh silhouettes make this Big Sister/Little Brother duo a statement-making pair. These adorable coordinating Mud Pie T-shirts boldly declare who is the big bro and lil bro in a patchwork of patterned letters set on handsome dark navy blue shirts. They’re boyish, fun and totally charming. Tribal arrows decorate these navy big brother/little brother T-shirts and unite the pair. Personalizing these arrow shirts with your children’s names makes these shirts winners, especially with boys who act a little like natives. What's a Car Seat Chest Clip?